Well I couldn’t let Veganuary go by without some sort of a vegan bake now could I? As some of you may have picked up by now, I’m trying to cut down on my sugar intake. I’m allowing myself one sweet thing a day and it’s not allowed to be junk. More often than not this month, it’s been hot chocolate. Although some days, I’ve had a few dates or a vegan version of my chocolate porridge. Last week, we had some workers round cutting down an old goat willow. It was a lovely tree and I felt a bit sad to see it go, but we need a lot more light if we want to grow our own veg again. Plus it was sucking up all of the water from the soil which was not what we needed in last year’s drought. It had to go. Anyway, the long and short of it was that I went all out and baked these vegan peanut butter banana muffins. Did anyone query them? Not at all. They were demolished with relish. I’m generally not a fan of American style muffins. I find they’re either too sweet or don’t really have much flavour. 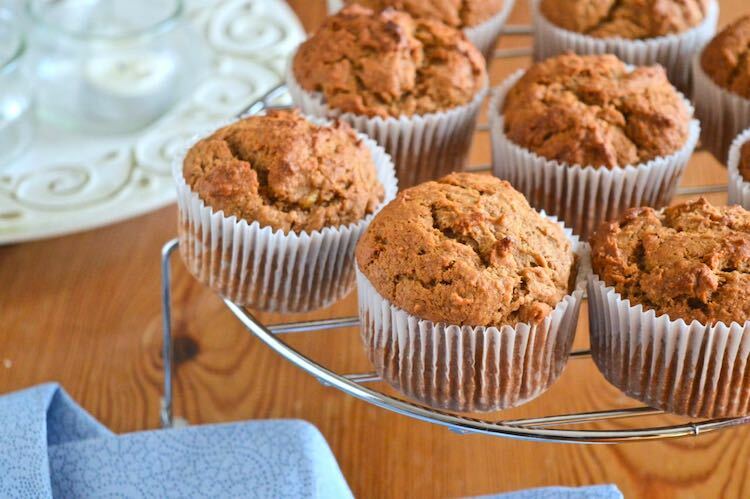 These vegan peanut butter banana muffins on the other hand, are neither too sweet nor lacking in flavour. They have a fabulous sticky banana bread quality to them too. If like me, you like your bakes to be nutritious, you will approve of these. They are made of wholemeal spelt flour, bananas, peanut butter, coconut sugar and a little coconut oil. Oh and some cinnamon to round it all off. The recipe is not only quick to put together but it’s very forgiving. If you don’t have any coconut sugar, it’s fine to use another unrefined sugar such as muscovado. I’ve found that coconut oil works really well in baking, but you could replace it with rapeseed oil or even sunflower oil if you need to. You can also replace the spelt with any wholemeal wheat flour, though I haven’t tried this recipe with a gluten free-one yet. If you prefer the idea of using your favourite nut butter, go ahead and use it. I can’t guarantee it will work, but I’m pretty sure those banana muffins will still be awesome. There were a few muffins that made it past the day of baking. I had one a day until they were gone and they were just as good on day five as they were on day one. 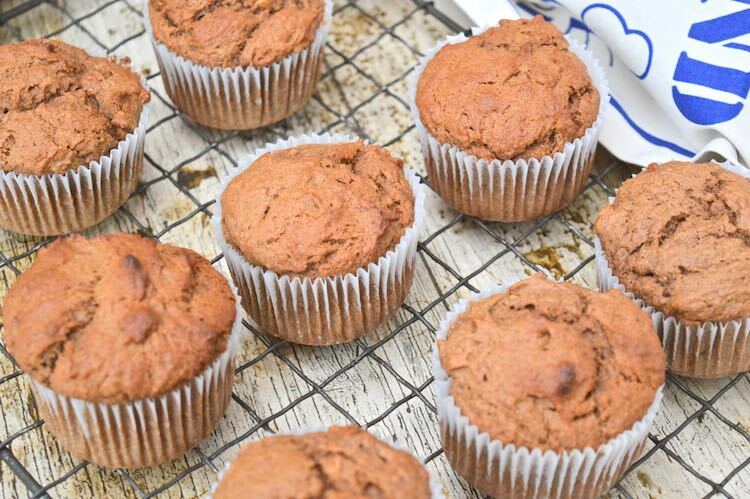 These tasty vegan peanut butter banana muffins perked up my lunch box no end. I might even make some more today. The vegan peanut butter banana muffins were so good, I had to make another batch. This time I wanted to try them with gluten-free flour to see how they turned out. My favourite brand is Free From Fairy’s wholegrain gluten free flour. It’s rice free and has worked well for me every time I’ve used it. Rather than peanut butter, this time I used some orange flavoured chocolate almond butter that I happened to have. The muffins were possibly even better than the originals. My wheat intolerant friend was delighted with them and kept telling me she couldn’t believe they were so good. This is a really quick and easy recipe to put together. They can be made in 30 minutes with very little faff. They're also delicious, vegan and not to heavy on the sugar. As with most of my bakes, they're made with wholemeal spelt flour. Roughly mash the bananas in a large mixing bowl. Beat in the peanut butter, coconut oil, sugar and vinegar until everything is well combined. Sieve in the dry ingredients, but remove any bran left in the sieve. Stir until the flour is just combined, but don't over mix. Spoon into nine muffin cases and bake for 20 minutes or until well risen and golden brown. The bananas need to be ripe so that they mash well, but they don't need to be brown. Bran inhibits the rising process, so leaving out the largest bits helps the muffins to get to a good size and texture. Orange blossom raspberry cupcakes via May I Have That Recipe? For even more vegan baking recipes and ideas, head over to my Vegan Bakes board on Pinterest. 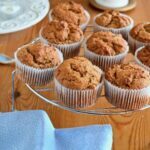 I’m sharing this recipe for vegan peanut butter banana muffins with The Peachicks Bakery for #CookBlogShare and with Searching for Spice for #CookOnceEatTwice. It also goes to Jo’s Kitchen Larder for #BakingCrumbs and Casa Costello for #BakeOfTheWeek. Thanks for visiting Tin and Thyme. 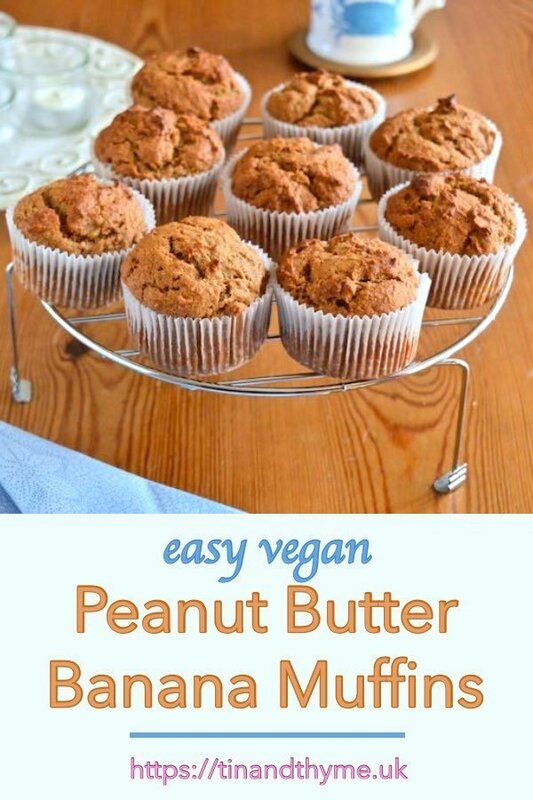 If you make these vegan peanut butter banana muffins, I’d love to hear about it in the comments below or via social media. Do share photos on social media too and use the hashtag #tinandthyme, so I can spot them. For more delicious and nutritious recipes, follow me on Twitter, Facebook, Instagram or Pinterest. Vegan Peanut Butter Banana Muffins. PIN IT. I really love the aroma and taste of coconut sugar. These muffins turned out really great, Choclette. Thanks Angie. I’m really pleased with them. I don’t know why I’m surprised. I’ve been impressed with every vegan bake I’ve made so far. These look deliciously moist and are a lovely vegan bake for anyone doing Veganuary. Thanks for sharing with #CookOnceEatTwice! Thanks Corina. They are super delicious and I reckon most people trying them wouldn’t have any idea they were vegan. Peanut butter and banana is such a winning combo. Your vegan muffins look delicious. Shame about the tree, but I bet you’re excited for more veg growing space! It’s a particularly good one and turns out I’ve got quite a few bakes with this combination on the blog 😀 Yes, we’re really looking forward to be able to grow a bit more. It will never be as much as we could grow when we had use of the field, but it will be something. Nut butters are wonderful, but they’ve become even more important this month. I seem to be going through an awful lot of them. Loving the peanut butter & banana combination in these muffins, often pair these two in sandwiches for my veggie daughter so know how good they are together:-) We need to cut back on sugar too but we’ve still been finding food from Christmas stashed away so hence the delay! Your daughters sandwiches remind me of my mum’s old favourite when I was a child – banana and date were the ones she made if ever we were out and about. Even in the two weeks I’ve cut back, I’ve noticed the difference – my joints aren’t nearly as stiff. This recipe sounds great. Would you have the conversion measurements? Sorry, this American doesn’t know how to convert to cups/tsp from g.
Hi Tamara. I’ve just googled the conversions, so I can’t vouch for complete accuracy. Go for 1 cup of flour and slightly under a ½ cup for the sugar. 100g peanut butter is about 3 ½ tbsp of peanut butter (I actually used 1 very heaped tbsp) and use 1 level tbsp melted coconut oil. I hope that helps. If you do try these, let me know how you get on. Sounds like a lovely snack. Veganuary would be a good opportunity to cut down on sweet food as you would have to think more about baking without eggs! But it has amazed me just how good bakes can be without eggs! So I was quite surprised to hear someone talking about Brexit this morning where they said it is like baking a cake without the eggs – I felt like they really needed to experiment more! Hahaha, that made me smile. Much needed at the moment as all talk of Brexit is deeply depressing. If only I just stuck to my own baking, I’d be fine with sugar, but I get into horrible habits of buying junk biscuits, chocolate etc. So I’m really pleased I’ve managed to cut those out so far this year. As for eggs, I remember being really surprised when I made my first vegan bake all those years ago – it was really nice! Oh no, does that mean you have an allergy to all nuts? I’ve just made another batch with chocolate almond butter which are pretty fabulous too. Otherwise, I’m sure seed butter would work just as well, it will just have a different flavour. Peanut butter is probably my favourite pairing with banana and it works wonderfully well in cake format. Oh yum, these look absolutely delicious, and peanut butter & banana is a stunning flavour combination. One of my favourite vegan breakfasts is peanut butter and sliced banana on sourdough toast. Pinning to make soon! Thanks Kate. I’ve had quite a few people telling me about peanut butter with sliced bananas. I will have to try it. 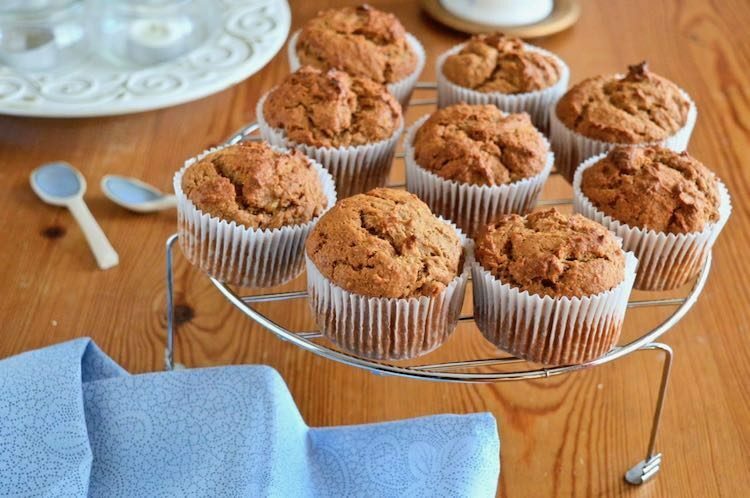 Love how delicious these muffins look and how perfect they are for filling a hunger gap…my problem is the 2-3pm lull in energy and one of these with a cuppa would be perfect to keep my energy levels up ready for the kids to come home and dinner prep. They’re a healthier snack than most. I’ve been having one at lunchtime with a sandwich and that’s kept me going until dinner with no problem at all. Banana and peanut butter go together so well! I could definitely polish off a few of these! It’s a winning combination for sure. Though these little numbers are surprisingly filling. Hi Choclette, these muffins look delicious. I’m like you in that I’m also trying to reduce my sugar intake. I’ve been experimenting with baking with maple syrup but haven’t tried coconut sugar yet. I’m also trying to bake more nutrient dense goods and they look like they fit that bill too. I’m going to put them on my breakfast list and try them with a gluten free flour. Thanks Anna. I don’t know if you’ve tried these yet, but I made a second batch with gluten free flour and chocolate almond butter. They might have been even better than the first batch. well done on getting so far along on your vegan journey this month. I always add much less sugar to my cakes and bakes than the recipes state and they are still sweet enough. Your muffins are such a lovely caramel colour and I love the flavour combination. Thanks Jenny. I don’t know why so many recipes have such vast quantities of sugar, it’s very rarely needed I find. Thanks Jo. These muffins are good on so many counts, not least because they don’t take long to prepare and cook. 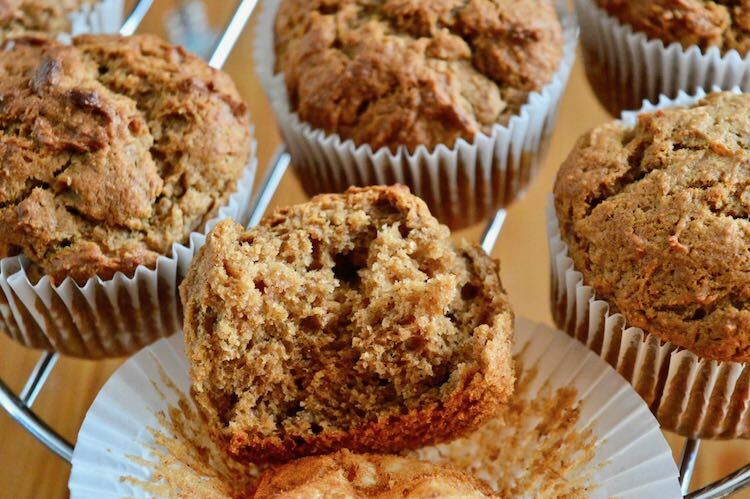 i have made many “healthy” muffins but by far these have come out the best! my more fussy husband also loved them, thank you. Yay, so glad they worked for you Melanie and that you both liked them. CT demolished most of these. I made a second batch with almond butter and gluten-free flour and they were rater fab too. I really love the aroma and taste of coconut sugar. Veganuary would be a good opportunity to cut eggs.